Elizabeth was the second daughter of Alice and Louis, and was eight years older than her youngest sister, Alix. She spent much time in England with her sisters and Grandmother Queen Victoria, but she was more 'German' than Aleksandra. Elizabeth, called 'Ella" by her family, married the Grand Duke Sergey Alexandrovich Romanov, brother of Alexander III and Nickolas II's >uncle. He was an unusual man, who was strongly disliked by many and was the subject of many rumours and gossip. They had no children. Grand Duke Sergey was blown up by a terrorist bomb in the Kremlin in 1905. Elizabeth heard the explosion and rushed outside, only to find here husband blown to bits. Elizabeth was, in great part, responsible for Nickolas and Aleksandra's marriage. She acted as matchmaker, to the chagrin of Grandmother Queen Victoria, who wanted the lovely Alix for her grandson, Albert Victor. After Sergey's death Elizabeth devoted herself to good works and the poor, opening a hospice and hospital convent dedicated to Martha and Mary in Moscow. She became abbess of the convent. The building was designed by the same architect who would, one day, design Lenin's Tomb and was embellished with exterior reliefs in old Russian Style. The interior was painted by the famous Russian painter Nesterov, who also designed the pearl-gray and white habit worn by the sisters of the convent. Surrounding the church was a lovely garden filled with fragrant lilies, flowers and lawns of grass. Elizabeth dedicated the convent to the poor of Moscow. It was a hospice, hospital and had a dental clinic attached to it. The sisters came from all walks of life. Orphan girls from the Moscow slums were raised at the convent and given an excellent education. Many of these girls went on to become hospital workers and nuns themselves. The convent was famous in Russia for its charity work, and the work of the convent was unique in Russia, setting an example for the rest of the country in good works. Elizabeth herself would care for the poor, nursing the worst cases of injury and disease herself. The nuns would collect the dying from the streets and bring them to the convent, where they were given a place of shelter and care during their last days. Elizabeth eventually became somewhat estranged from her sister, Aleksandra, over Rasputin and the growing chaos in the country. 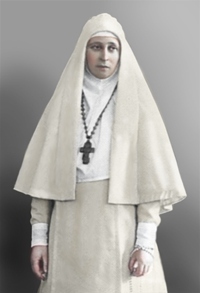 Untouched by the revolution in her beautiful Art Nouveau convent, she was eventually arrested by the Bolsheviks and exiled to Siberia, where she was brutally murdered and thrown down a mine with five other Romanovs, a nun companion and a servant. Her body was recovered and now rests with her nun-companion, Barbara in the Church of St. Mary Magdalene in Jerusalem. Elizabeth has been canonized by the Orthodox Church. The convent was closed in the 1920's but the nuns continued their work underground during the Soviet Era. They survived and are trying to reestablish their work in Russia today. The convent is preserved and houses a ikon restoration studio. A statue to Elizabeth has been erected in the remains of the church gardens.